Eye pleasing, work achieving. 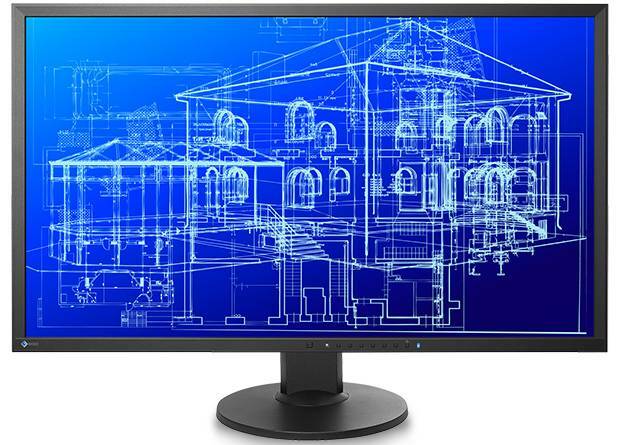 CAD, business, gaming, video – this 31.5-inch monitor does it all. With its 4K UHD resolution and 60 Hz refresh rate, the FlexScan EV3237 provides you with an exceptional experience no matter the application. The FlexScan EV3237 packs more than 8 million pixels with over 140 dpi (dots per inch) for amazing results. Documents and images look smoother than ever with a 4K UHD screen, offering you the finest visual experience. The IPS panel has 178° viewing angles so it exhibits minimal change in contrast and hue when viewed from off center. This makes it ideal for viewing a variety of content from any angle and also allows more than one person to view the screen clearly. Increase your work efficiency by displaying more on screen at once without needing to change windows or scroll excessively. View 4K photos and videos in full screen to truly see the difference with the FlexScan EV3237’s 31.5-inch screen. A brightness sensor called Auto EcoView detects the fluctuations in the ambient brightness throughout the day and automatically adjusts the screen so it is neither too bright nor too dark. In addition, Paper Mode simulates the look of paper by reducing blue light, a cause of eye fatigue, to prevent eyestrain when reading documents. Adjust the screen to the most comfortable angle for individual use or easily reposition it to show a colleague or client. The versatile stand offers height, tilt, and swivel adjustability for optimal comfort in any setting. The FlexScan EV3237 offers flicker-free viewing at all brightness levels. Now you can work without worrying about the eye fatigue caused by viewing a flickering screen for long periods. Five preset modes ensure you always get the right setting for whatever application you are using. With the bundled ScreenManager Pro for LCD software, you can assign any of the monitor’ s preset modes to a particular application. Whenever you activate that application, the monitor will automatically switch to the assigned mode. Hue, gain, saturation, and color temperature in 500 K increments from 4,000 – 10,000 K (and 9,300 K) are all user adjustable. An sRGB mode is also included for color matching with other applications and peripherals that also support this color space. Picture by Picture (PbyP) is a feature that allows you to view data from multiple signal sources on a single screen simultaneously. Select from 5 different layouts easily accessible via a button on the front of the monitor. Picture by Picture can be used to run both Windows and Mac operating systems simultaneously or multiple applications in varying layouts and size to suit user preference. Picture in Picture (PinP) allows you to display a small separate screen from second signal source within the monitor. This allows you to effectively multitask such as viewing a video conference while working in other applications. The screen’ s size and position can be adjusted to your preference. DisplayPort 1.21, Dual-Link DVI2 and HDMI2 digital inputs are equipped for compatibility with multiple devices. Picture by Picture and Picture in Picture are also supported when using a dual-monitor setup. The monitor comes equipped with three USB ports, one of which can be used to charge your smartphone, tablet, or other devices. Selecting “Charging Only” from the OSD menu speeds up the charging process. The FlexScan EV3237 reproduces smooth images by taking an 8-bit signal (256 tones per RGB) and selecting the optimum color values from a 10-bit look-up table (1,021 tones). The optimized data is converted back to an 8-bit output signal for the smoothest gradations. In a dimly-lit work environment, a monitor with low brightness settings is more comfortable to use. With its LED backlight, the FlexScan EV3237 is adjustable to just 1.0 % of the maximum brightness, making it ideal for viewing in low ambient lighting conditions. A manufacturer’s 5-year warranty covers all compon ents including the LCD panel to ensure a long service life. This warranty is 2-years or 67% longer than the standard 3-year warranty of most monitor brands for significantly lower running costs. An overdrive circuit accelerates gray-to-gray response time to just 5 ms to minimize ghosting and blurring in moving images so they always look clean and sharp. Dual 1-watt speakers are installed without increasing bezel size. A headphone jack is also conveniently located on the side of the monitor. 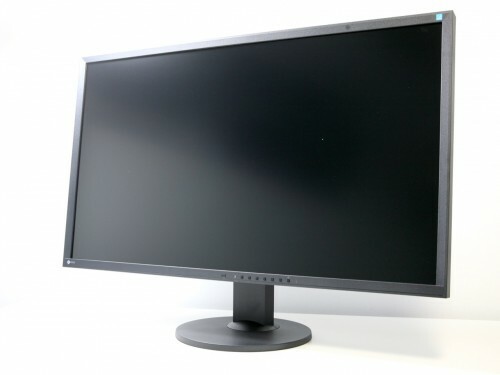 All of the monitor’ s settings are adjustable using the EIZO Monitor Configurator software. You can even save your settings as an xml file and apply them to another monitor via USB. The FlexScan EV3237 offers a number of features for lowering power consumption. The Auto EcoView brightness sensor automatically lowers brightness according to ambient lighting and EcoView Optimizer 2 reduces backlight brightness and increases gain when viewing dark content. In addition, a presence sensor prompts the monitor to switch to power save mode when you are absent and then power on again when you return to save on energy while the monitor is not in use.